Summer is at its peak. According to the Hindu calendar prediction 'Nautapa' – “NAU” means nine and “TAPA” means hot (nine hot days) has fallen between 25th May and 9th June. It means that these are the hottest days of year. But against the common belief, mercury hasn’t shot up as yet. This year prior to ‘Nautapa’ mercury soared to 45°C in areas near Bali whereas ‘Nautapa’ till now has been relatively bearable at 42°C to 43°C. Officially in meteorological department, highest temperature in summers is normally not recorded during this 'Nautapa'. Rather temperature starts coming down due to pre-monsoon activities and development in monsoon streams, including Bay of Bengal and Arabian Sea. Similarly, another belief that monsoon would be poor if it rains during 'Nautapa' does not hold any significance in meteorology. In fact it is due to frequent power cut that heat becomes unbearable in rural areas. During the week the sky was clear and bright. Humidity dropped to 16%. Highest temperature recorded was 45°C and lowest at 30°C. Wind was at 13km/hr. Training continued. Mr. Patro worked on drills topic presentations for speech like seasons, festivals, national days to prepare for an assembly talk. All teachers gave separate presentation. Time was given but no one was allowed to read. Discussions on dowry got all involved conscientiously to relate to their own marriages and their children’s marriages. Some serious discussions took place deciding whether it dowry be considered a gift for a daughter or it should be stopped. These presentations have not only helped teachers to pronounce and speak correctly but have helped them to open up and speak in front of everyone. Circle time is consuming more time as teachers speak their heart out. It has helped the teachers to take the centre stage and gain confidence. 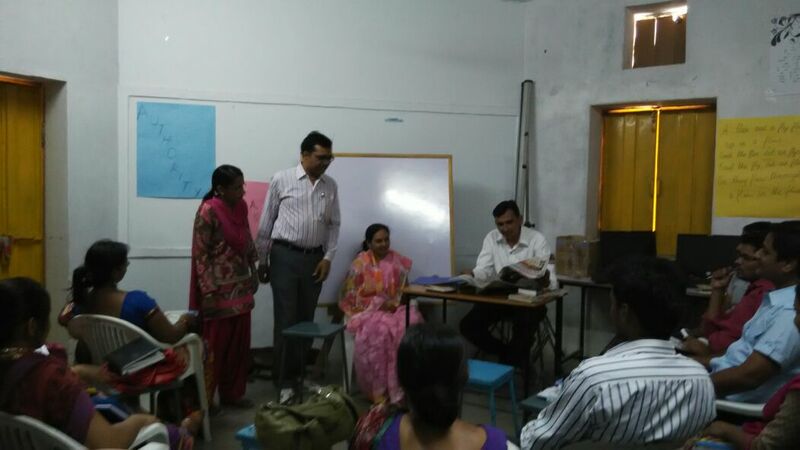 After each presentation Mr. Patro gave on the spot feedback so that the respective teachers knew their mistakes. He did so because he doesn’t want them to repeat the mistakes again. Initially the idea of attending a workshop in summers after a long and hectic academic session did not appeal to me but as it was mandatory, there was no option. Later, after attending it for about a fortnight it proved to be very beneficial not only to me but to my colleagues also. Initially, I felt bad whenever Mr. Mithilesh pointed out my wrong pronunciation of words during circle time or during the sessions, but later when I thought over it I realized that, even if I am not a language teacher, I am a teacher and it is my duty to teach my students the correct pronunciation of words. Today, I see a great change in me as I never imagined myself singing a song in public, participating in discussions and other activities of workshop with correct pronunciation of words, trying to slow down my speed of speaking the words with a polite tone. Sir (Mr. Mithilesh) in a friendly discussion told me about speed of speaking words, my aggressive tone, which I think nobody told me in my teaching career. This change is noticed in most of my colleagues, as now they try to speak in English, especially in Pre primary and primary where they will lay the foundation of English language in our students, I wish them all good luck. Use of Computers was my weakness, throughout the year Ma`am, SKS, BJH, KGL and SNI helped me out, whenever I had problems whether it was formatting the question papers, typing papers of Math with signs and symbols etc. SKS explained us the use of drive and other concepts during the practical always with a smile, which made it easy to learn. To conclude Ma`am pointed correctly that we should excel ourselves with the changes of education industry as one day we all will be heading institutions, so this PDP will provide a launch pad to all of us. I would like to thank the management for this initiative which is an opportunity for all of us. I am really thankful to Principal Ma'am for taking this initiative and giving us the opportunity to learn more and improve our English. At this age I am getting to learn so much. I have enhanced my communication skills. Now I feel more confident. It's a great fun to be a part of Mithilesh Sir’s Class. His way of teaching is very effective. I love the singing part of our class though I am not a good singer but I enjoy singing. Through this training we got to know each other and this helped us to be more sensitive towards each other. We had even worked as teams and developed mutual understanding between us. In our IT class we learned how to work on Google Drive. And looking forward to learn more. I am very grateful to Ma'am because it was she who believed in me and gave me this chance. 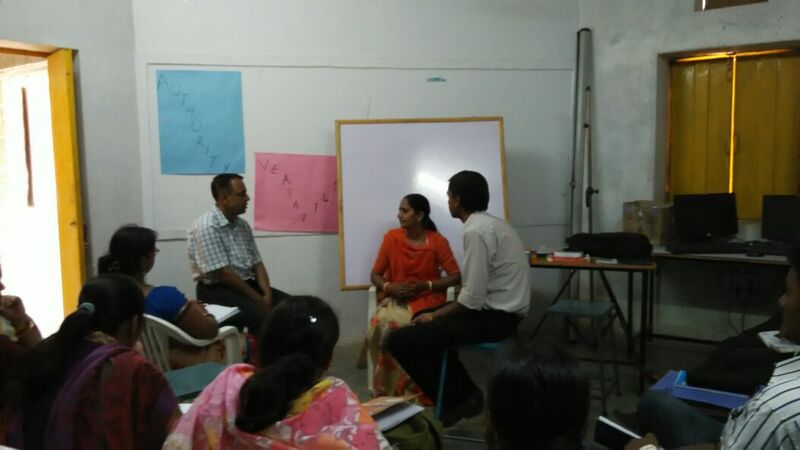 The Fabindia School conducted Summer Training for all teachers on 11th May 2015 with English Spoken and I.T. Classes. For that Mr. Mithilesh Patro appointed as a trainer for English and Mr. Sandeep Singh appointed as I.T. trainer. Aim for this training session is to make every teacher skilled in both Spoken English and I.T. In these sessions active tools and techniques are being used to make teachers more fluent and proficient. I have also found Lime-Light where I am growing day by day. This session of English Speaking Training and I.T. training is helpful for me to make me more confident person. After attending those sessions I am feeling more confident as well as my vocabulary is also improved and I learned lot of new words. Through more training sessions I need to move a step ahead where I am today. 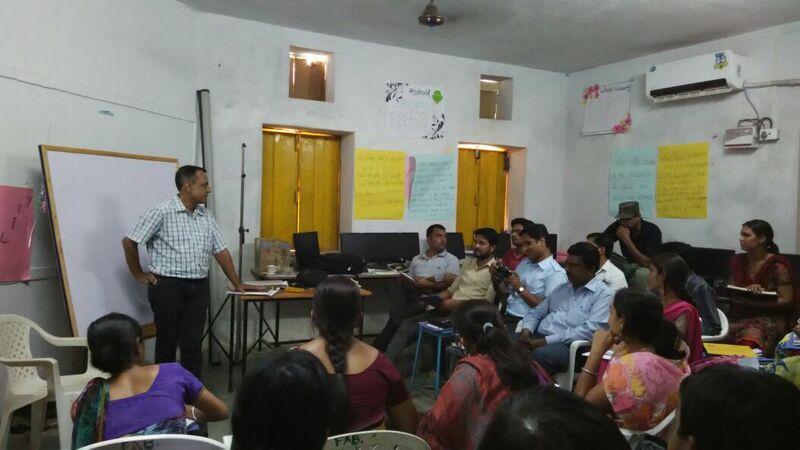 The Fabindia school has organized a Teacher Development Programme to improve various skills of the teachers working in the school. The programme consists of training teachers for English and IT. In the English course the teachers are taught about tenses and its uses, pronunciation, phonetics as well vocabulary improvement. It is really an interactive session and teachers who had a fear of public speaking are motivated to learn and speak. It also has IT classes which are divided in two levels: Beginners and intermediate. At the beginner’s level the teachers are told about the basics of computer like MS word, paint etc. They are told about various shortcuts using keyboard also. Thus, during this boring summer vacations the teachers’ time is being utilized in a very fruitful way and its learning through fun. English Proficiency training has been very fruitful for me. I have learnt to make sentences, vocabulary words and use tenses. Phonetic drills have also help me to improve my pronunciations. I have gained confidence and now I am able to present my views in front of all. I do not hesitate any longer. The knowledge in the circle time has helped me to learn a lot and the bonding between the teachers has become strong. Every day we have new learning as we are given new topics to present. I gave IT training to the beginners. I taught them how to start and shut down computer; MS word and basic knowledge ms office. By seeing this progress in me I have confidence in myself that now I can speak English. 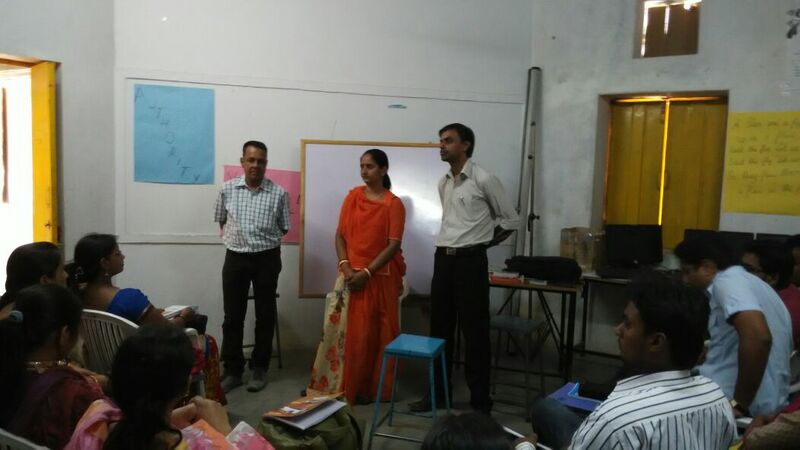 The Fabindia School conducted Summer Training for all teachers on 11th May 2015 with English Spoken and I.T. Classes. For that Mr. Mithilesh Patro is appointed as a trainer for English and Mr. Sandeep Singh appointed as I.T. trainer. Both the trainings are highly fruitful to me, I have enjoyed a lot with learning and developing knowledge in English and IT. These trainings have made me more confident and skilled . Today, I feel as skilled person and I have gained confidence. It will help to formulate my bright future and give effective delivery in my present task. In the beginning when I joined the school in July 2012 Mr. Sandeep Dutt, Chairman asked us in a meeting that the teachers who don’t know how to use a computer please raise your hands. I remember I was the only teacher who said that Sir, I don't know how to use a computer. I was very keen to learn and here I am. This IT training is very useful for me. I am thankful to Principal Ma’am and Chairman Sir and my dear colleagues for supporting me and motivating me to learn many new things. English Training is really very helpful for me. I have learnt phonetic sounds, proper pronunciations of many words, framing questions and how to keep our children busy during class hours with lot many activities. I also learnt many English songs. Our English and IT training started from 11th Of May. Mr. Mithilesh Patro and Mr. Sandeep Singh are our trainers for English and IT. In English I have learnt the pronunciation of many words, some new words and grammatical rules. The most interesting session of training is learning English songs. We enjoyed singing and learnt some sounds. Day by day we are becoming more confident in English. In IT I have learnt how to use some features of Google Drive. Every morning during circle time we talk about our learning of the previous day as well as we talk about our self. We have done many group activities. From all these activities we are not only learning about English and IT but we are also learning how to work as a team spirit and how to co-operate with each other and that grow faith among us. As I believe these things play main role for the development of any institute. I am very thankful to our Principal Ma’am and management for providing us with such a wonderful opportunity. I hope this training will be useful and effective for our class teaching. On the first day of the Professional Development Programme Mr. Mitilesh Patro, English proficiency trainer introduced his aim in taking up this training and how he will go about. He divided all teachers into five groups and selected leaders. Each group was asked to discuss and write their expectations from the workshop. All groups presented expectations in front of everyone. Mr. Patro took Parts of Speech and Phonetics. After lunch break staff learnt the song ‘Doe a Deer’. Practice sessions on pronunciation took place. The trainer gave different topics to prepare like Simple Ten Commands that are used in the Class daily, prepare a Questionnaire to converse with Mr. Dutt to each group and told them to make 10 possible questions related to them for presentation. After lunch break staff learnt another song ‘500 Miles’. In the morning the remaining presentations on the topic: “Prepare queries that students ask in Class and prepare ten questions that you will ask when Dr. Seema Sharma comes.” The groups gave a wonderful presentation. After lunch break staff learnt another song ‘I Have a Dream’. She sells seashells by the sea shore. The shells she sells are surely seashells. So if she sells shells on the seashore. I’m sure she sells seashore shells. A flea and a fly flew up in a flue. Said the flea,” Let us fly!” Said the fly, “Let us flee!”. So they flew through a flaw in the flue. Betty Batter had some butter. “But,” she said, “This butter’s bitter, If I bake this bitter butter it would make my batter bitter. But a bit of better butter-that would make my batter better”. So she bought a bit of butter, better than her bitter butter, and she baked in her batter and the batter was not bitter, so twas better Betty Botter bought a bit of better butter. Peter Piper picked a pack of pickled peppers. Did Peter Piper pick a pack of pickled peppers? If Peter Piper picked a pack of pickled peppers, where the pack of pickled peppers Peter Piper is had picked. After lunch break staff learnt another song ‘You are My Sunshine’. Once, await, aware, always, anyone, award, anywhere. After lunch break staff had IT training. The teachers were divided into Beginners and Intermediates. The Beginners learnt to Copy, Paste, MS Word and basic knowledge of MS Office. The Intermediates learnt how to use Google Drive. In Google Drive staff learnt uploaded a file, created a folder, converted word into Google Docs, Excel Sheet into Google Sheet and edited it on the Drive. Then the staff was asked to do it practically on Computers. Staff learnt Present Continuous Tense. Definitions were given. Then sentences were given and teachers were asked to fill in the correct Present Continuous Tense. All were asked to make five sentences using Present Continuous Tense and present it before the class. Squatting, tweaking, itching, scratching, nodding, exercising, rotating, reclining, clinging, leaning, bowling, etc. In this way teachers were able to learn a whole lot of vocabulary words and their meanings. A list of regular and irregular words was made in its three forms of verbs (First, Second, Third Form of Verbs). The trainer also told the correct use of have and having. Encore, chassis, restaurant, hotel, mirage, rapport, rapprochement, gourmet, brochure, valet, hovs d’oeuvre and joie-de-vi-vre. He showed a mime art form (Contemporary Dance) The emotions that he expressed were of sadness, happiness, anger, surprise and joy. Teachers were asked to give a title and create a story on his performance. Priyanka Mahatma gave the title “Hope” to her and narrated her story. Sharmila Vijaywargi gave the title “The King of the World and Mr. Patro gave the title “Wonder” to his story. After listening to their story Gilles Chayen said that it was the pattern of the floor that gave the form of his dance. He said that every emotion in the dance had a particular speed and texture. Mr. Chayen also said that art forms comes from awareness of life. and dance is a language enjoyed by all. Use of ‘since’ and ‘for’ was clarified. Staff listened to the conversation between Mr. Suhel Seth and Mr. Karan Thapar. The Class was asked to jot down the difficult words and then the meanings of the words were given. Blurred, incognito, innuendo, fiasco, conduits, exaggerates, ostentatiously. In the morning staff learnt Modals and their uses. A short clip of a movie “Rio Bravo “was shown. After lunch break staff did IT where they learnt how to upload a file in Google Drive, how to move a file and drag it. After the demo everyone did the practically uploaded one file each. I learnt Parts of Speech and my tenses have become clear. I have also learnt correct pronunciation of many words by the Phonetic Drill we had. I learnt to frame sentences. In it I learnt to use typing in Microsoft Word and change the font. As a Hindi Teacher this is a wonderful experience for me .This English proficiency training has given a chance to me to speak in English. I have gained confidence, is now able to present my views in front of all. I do not hesitate any longer. The knowledge in the circle time has helped me to learn a lot. I have learnt to make sentences, use vocabulary words and tenses. Phonetics Drill has also helped me to improve my pronunciations Everyday we have a new learning as we are given new topics for presentation. I have learnt in IT about Google Drive. Seeing this progress in me I have gained confidence in myself that now I can speak English in front of anyone and I feel good while conversing. This year’s Summer Training Program is very useful for me. I learnt many new words, pronunciations, vowel sounds and how to frame questions. I have improved a lot and will try to improve more. I practice Simple Past Tense and Simple Present Tense I have improved my speaking skills. In IT training I have learnt the basics like how to start, shut and copy paste. I learnt short keys and also I learnt how to create files. I will keep practicing and increase my knowledge in Computers. On Saturday Mithlesh Sir explained us the use of Modals (Would, Should, May, Might, Can, Will, Shall and ought) with examples, that time I could not understand but now I am trying. In IT I learnt how to create new files and folder and how files move to the folder. This is a short story of a boy who did not want to get married. One day his father called him to see a girl. He kept thinking the whole way how he could reject the girl. He was in fix. When the families met the boy wanted to talk to the girl alone so he took permission from her parent’s. He did not want to reject the girl immediately so he asked her some questions. Boy How old are you? Girl: I am 18 years old. Boy: You are 18 years old and I am 27, do you still want to marry me? Girl: Yes, I want to marry you. Boy: Can you wait for two years? Girl: It depends on my parents. The boy’s parents wanted to force him to marry the girl. So the boy talked to the girl’s parents and told them she was not of marriageable age at that time and he preferred that she wait for at least two years before marrying him. Her father replied that as she was the only one daughter they could not wait for two years. The boy was, therefore, able to refuse the proposal without offending anyone. I am very happy to be the part of the training. It is a great experience for me. I learnt vowels sound and correct pronunciation of many words. I also learnt to frame questions. Now I am confident to speak in front of everyone. I learnt to use tenses and make sentences. IT training is also helpful for me. I learnt basic knowledge of MS Word. I am very thankful to Mithilesh Sir, that he made me come out of my shyness. Mr. Mithilesh Patro took our classes. During the classes on the first day we introduced ourselves to Sir and talked simple sentences with him. I learnt the following things: Pronunciation of letters and words, learnt some new vocabulary words, learnt to converse with each other, Phonetic sounds and tenses. I learnt some new English songs. I learnt how to give speech on a topic. In IT Training I learnt how to work in Google Drive. In Google Drive I learnt to share files and how to make a folder and share it with others. I learnt how to create and upload file and how to drag files.